Done deal 2015 summer: Everton sign Barcelona winger Gerard Deulofeu Everton have completed the signing of Barcelona winger Gerard Deulofeu, according to SkySports. Everton have completed the signing of Barcelona winger Gerard Deulofeu, according to SkySports. The Spaniard attacker who spent a 2013-2014 season on loan at Everton has now penned a permanent deal. Also See: The Important Completed deals of this summer! The 21-year-old will be joining next month. He has reportedly signed a three-year deal with an option to extend for another season. Deulofeu spent last season on loan at Sevilla and impressed with his displays. His contract with Everton has a release clause that if Barcelona want to resign him within the next two years then they can have him by meeting the contract requirements. Everton boss Roberto Martinez told after his signature that he does not need any introduction, he has already spent a season at Goodison Park. The attacker is very happy with his move to Premier League side and is keen to become an important part of the team. 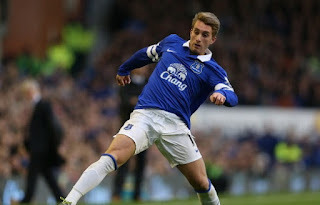 Deulofeu scored three goals in 3 appearances for Everton during his loan spell. The Spaniard becomes the second summer signing after the signature of Tom Cleverley from Manchester United. Martinez further added that they are on the right track. They made a plan of sealing these two deals as quickly as possible and they have done it.